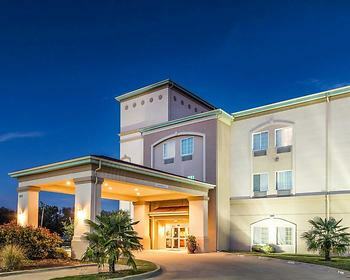 Hotel Quality Inn & Suites, Groesbeck, United States of America - Lowest Rate Guaranteed! Located in Groesbeck, Quality Inn & Suites is a 5-minute drive from Fort Parker State Park and 6 minutes from Old Fort Parker. This hotel is 8.7 mi (14.1 km) from Confederate Reunion Grounds State Historic Site and 11.9 mi (19.2 km) from Mexia Public Schools Museum. Logos, brands, and other trademarks featured within this site are the property of their respective trademark holders. These trademark holders are not directly affiliated with Hotelsone. Quality is a registered trademark.© 2001 - 2019 HotelsOne. All rights reserved.